LA JOLLA, Calif. — A team of biologists at the Salk Institute in California has reportedly created the first-ever human-pig chimeras in an effort to test the idea of growing organs in animals that can later be used in human transplants. 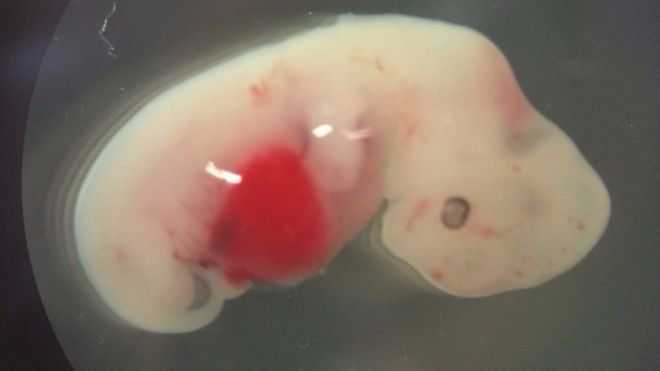 The concept of creating the hybrids, which are less than .001 percent human, involves injecting human stem cells collected from the patient’s skin inside of a small pig embryo, which is then implanted in a sow. The organ, grown for one month, would then be harvested from the pig and transplanted into the waiting patient. The results of the study, “Interspecies Chimerism with Mammalian Pluripotent Stem Cells,” were published in the scientific journal “Cell” this week. “Besides gaining insights into species evolution, embryogenesis, and human disease, interspecies blastocyst complementation might allow human organ generation in animals whose organ size, anatomy, and physiology are closer to humans,” it reads in part. The team at the Salk Institute attempted to use rat cells to create the pig chimeras, but the test was unsuccessful. The study was also conducted in cattle. “The pig has certain advantages over cattle for experiments involving post-implantation embryos, as they are a polytocus species, and are commonly used as a translational model given their similarities to humans concerning organ physiology, size, and anatomy,” the report explains of its findings. But the experiment also had its challenges as out of the 2,075 embryos implanted, only 186 survived, and had an estimated “one in 100,000 human cells.” There are also questions over whether or not the human body would reject the hybrid organs since they are primarily composed of pig cells. “This is the first time that human cells are seen growing inside a large animal,” Professor and Salk Institute team member Juan Carlos Izpisua Belmonte told BBC News. But he also recognized the ethical concerns surrounding the matter.